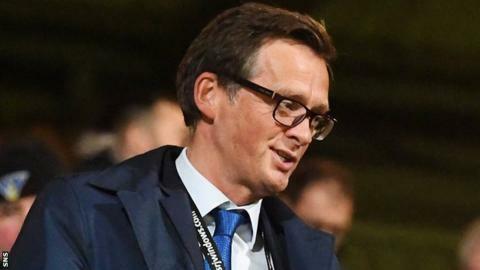 Dunfermline Athletic's chairman has criticised some fans after incidents of vandalism, the alleged abuse of players' families, and an incident in which a steward was hospitalised. Ross McArthur has warned those misbehaving "will be ejected" from East End Park after "wholly unacceptable" behaviour at home and away matches. Toilets were flooded at East End Park and he also cited players and staff being "routinely abused", adding "it has also now spread to abusing our families too." A steward was taken to hospital during the defeat by Partick Thistle at Firhill on Saturday. "I am genuinely sorry for our true supporters that they have to read about, and suffer the consequences of, the behaviour of a minority, and I certainly would not tar them with the same brush," said McArthur. "The behaviour of a handful of people in the Dunfermline end at Firhill on Saturday was nothing less than disgraceful - and a huge embarrassment to the club." Dunfermline are seventh in the Scottish Championship and Allan Johnston's side visit Queen of the South on Saturday. "Results are not what any of us would have hoped for," McArthur said. "I fully accept that I, the board and the manager are all accountable for this. "However, what I will not accept is the level of abuse affecting the families of our employees including those of the players, manager and me."